… I truly do miss my brain the most. As I pulled into Tangle last evening to teach a sock class, I realized that I’d forgotten all of my class materials at home. Oops. Alice loaned me a package of stitch markers. My wonderful students rallied and let me borrow their books and rounded up a few pencils. Fortunately we had done all of the “sock math” last week, so the lack of calculators didn’t cause too much of a problem. A small addition to the collection was waiting in the mailbox at home after class. Gentle reader, I can’t begin to tell you how much I have lusted after this yarn. 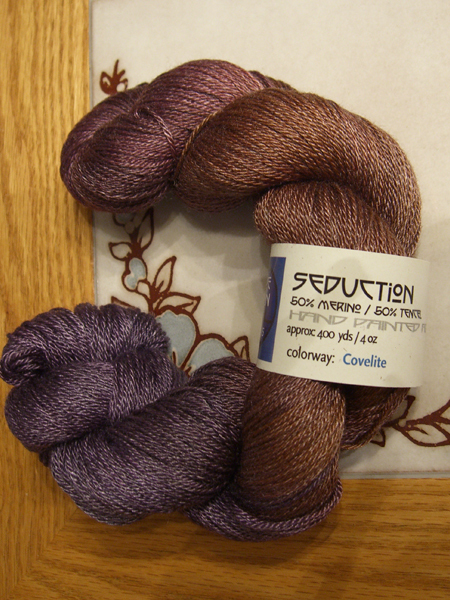 This is Blue Moon Seduction in the colorway Covelite. Even though I had to take an icky artificial-light picture, the colors are fairly true on my monitor. It really is that deep chocolate, purple and mauve. With 50% merino and 50% tencel, it has a wonderful sheen. I can’t wait to knit with it! Oh… I could just eat it up! I think I’m going to have to teach a sock class very soon!